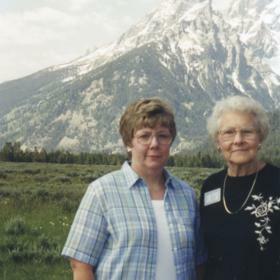 For Carolyn Bouman, faith and family was the cornerstone for which she lived. Her greatest joy was the family she loved, and she worked hard to make a good and loving home for them. Somewhat frugal due to the times in which she was raised, Carolyn’s honest heart knew no bounds. A fun-loving woman, Carolyn created numerous memories which will continue to be treasured by those she leaves behind. Carolyn was born at a time when America continued to recover from World War I and was straining to rebuild its economy. Yet the nation’s can-do spirit was reflected in Charles Lindbergh’s solo flight across the ocean, Henry Ford’s mass production of the automobile, and the Suffrage Movement that won women the right to vote. For Leonard and Bertha (Tein) Roobol, the Christmas holiday was made brighter by the December 27, 1923 birth of their little girl, Carolyn. Young Carolyn’s father emigrated to the U.S. from the Netherlands with his family as a young man and made a way for himself and his family as a celery and pickle vegetable farmer. Bertha, Carolyn’s mother was an accomplished seamstress. 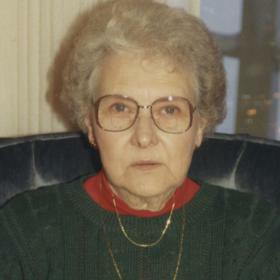 The youngest of three children in the Roobol household, Carolyn joined her older siblings, Art and Sue in their family home located in the close knit community of Martin, Michigan. Raised on their family farm, Carolyn came from a very close and loving Christian family. Injured as a young man, Carolyn's father was completely deaf by the time of her birth so was never able to hear her voice. He was a dedicated family man and a hard worker. There was never a shortage of chores to be done on their farm. As a child, Carolyn spent time in the celery packing shed. One day while sitting on a pile of wax paper, Carolyn slid into the ice cold water where the celery was being washed. When old enough, she helped on the farm and during her youth she picked an endless amount of pickles. One year the packer provided a box of chocolate for every hundred weight of small pickles picked. The Roobol family actually acquired so many boxes of the chocolate they gave them away to everyone they knew. 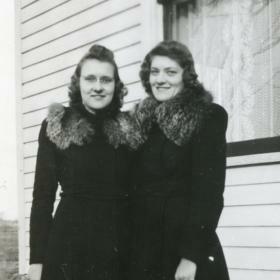 Carolyn and her sister, Sue, were inseparable and throughout their youth they enjoyed many adventures together. 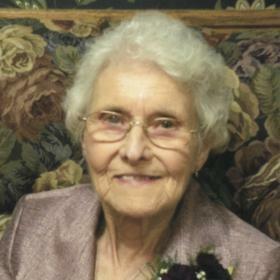 Carolyn also counted Eunice (Bishop) Williams as a best friend and they remained so into their adult years. Although Carolyn enjoyed a typical childhood for the times, the years of the Great Depression took a toll on everyone, and Carolyn’s family was no exception. Although the times were indeed difficult, Carolyn and her family remained close and counted on their steadfast faith. As members of East Martin Christian Reformed Church, Carolyn was involved with the youth at church and truly appreciated the blessings that came her way. Having attended Walker School in Martin for her elementary education, Carolyn was able to take four grades within a two year span which allowed her to graduate from Martin High School at the age of 16. To further her education, she enrolled in Parsons Business College in Kalamazoo for a one year secretarial course. It was about this time when Carolyn caught the attention of Gerald Bouman, a young man who attended the same church. They dated briefly before Gerald entered the U.S. Army during World War II. Most of their courtship was through the U.S. Mail where they were able to share their hopes and dreams. Throughout the five years of Gerald’s duties overseas, Carolyn worked for Locke Insurance and Kalamazoo Label Company. Upon Gerald’s return home from the war, Carolyn was overjoyed to be united in marriage with Gerald on June 20, 1946. Gerald and Carolyn were active members of the East Martin Christian Reformed Church and their faith remained at the forefront of their lives together. They eventually welcomed the blessing of two children, Marcia and Randy who added joy to their lives. Although both Carolyn and Gerald were disciplinarians, they were very loving and attentive parents. Through the years, memorable times were shared during the holidays and other special occasions as a family. As a couple they were passionate about Christian education and made whatever sacrifices were necessary so their children could receive a good, Christian education. Gerald and Carolyn were very involved in East Martin Christian School as well, serving on the school board and committees to raise funds for the school. Carolyn made a good home for Gerald and their family. When her beloved Gerald sadly passed away in December of 1971, Carolyn returned to the work force. For the next 17 years, she worked for the Allegan County Farm Bureau as the office manager prior to her eventual retirement. Over the years Carolyn also enjoyed sewing, cross stitch and reading in her free time. True to her nature, one of Carolyn’s favorite expressions was, “fit as a fiddle” and always an outgoing woman, she was the number one fan of whatever sport her grandsons were involved in at any given time. Following her retirement, Carolyn did a little traveling and remained an avid volunteer in fundraising for East Martin Christian School. She continued to be involved in her many church activities and attended the weekly Coffee Break Bible study at church which she so enjoyed until poor eyesight and hearing became an issue for her. With a quiet yet steadfast faith, Carolyn Bouman was an example to all who came to know and love her. Her faith and her family were most important to her, and she was ever committed to her Lord and family. Fun-loving, Carolyn always had a smile and will be dearly missed. As a devoted wife, mother, sister, grandma, great-grandma, and friend, her legacy of faith lives on. Carolyn Bouman was called home by her Lord and Savior on April 14, 2017. 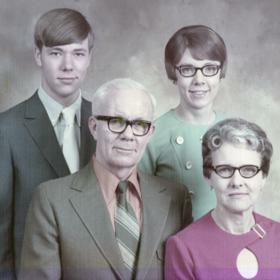 Carolyn was preceded in death by her husband, Gerald on December 9, 1971; her parents; brother, Art, and sister, Sue Timmer; as well as two great-granddaughters, Harper Jae and Emerson Joy. Surviving Carolyn are her two children, Marcia Bouman and Randy (Mary) Bouman, all of Martin; four grandchildren, David (Chelsea), Jeffery (Kathryn), Kevin, and Eric (Nicole); four great-granddaughters, Emma, Addisyn, Mackenzie, and Kayla, along with many nieces and nephews. Carolyn’s family will receive friends on Tuesday, April 18, 2017 from 4-7 pm at the East Martin Christian Reformed Church. The funeral will be held on Wednesday, April 19, 2017, at 11:00 am at the church with Reverend Derek Noorman officiating. Interment will be at East Martin Cemetery.  Please visit Carolyn’s webpage at www.lifestorynet.com where you can sign her online guestbook and share a memory. Memorials may be made in Carolyn’s memory to East Martin Christian School. Carolyn’s family is being served by RMDG Life Story Funeral Home.